Powers/Abilities: Good fighter, excellent shot. History: District Attorney Bill Perkins became the masked Mouthpiece in order to bring to justice criminals who had evaded the system. 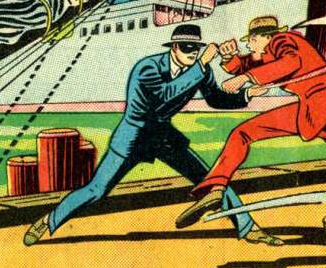 He was a ruthless vigilante, prepared to kill opponents if he felt the situation required; in one instance he threw a harpoon into the back of a fleeing opponent (he'd run out of bullets), rather than let them get away. The Mouthpiece appeared in Police Comics #1-13.